I’ve been keeping my head down, figuratively that is, more like sticking it in front of the computer. I’m working on a book about a very special place, and I’ll share more about that soon. One of the inspirations for the work is the notion of “mystery” and what we don’t understand. There is really so much in nature that escapes us and I’ve been looking at images from my collections that illustrate that joyous yet perplexing fact. 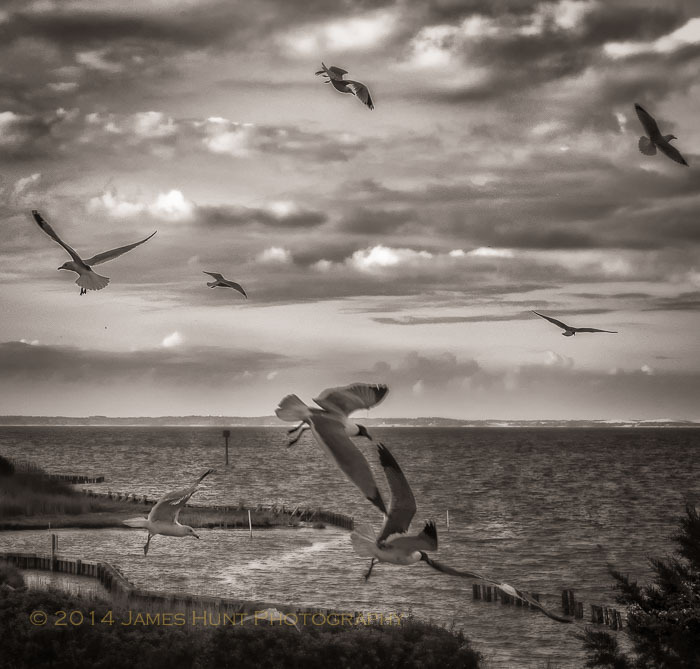 Here’s one from Manteo taken in 2012. Obviously it’s a bunch of gulls in a frenzy. But, what was the frenzy all about? Normally you’d think “gulls going crazy, must be a fishing boat around here someone throwing some waste overboard.” Good guess, but in this case, no boat. I’m standing on the deck of a condo in Manteo, North Carolina. I felt I could practically reach out and touch them. And no, I didn’t have anything for them to eat. (You should never feed wildlife, even gulls, with the exception of the strategically thought out bird feeder.) Of course, maybe they were hamming it up for the camera. Glad I could oblige. They were quite professional as colleagues go.